The McInnes Room in the Student Union Building is buzzing. Forty-nine third-year dentistry students are explaining the results of their research to the circulating judges and groups of interested visitors, while seven groups of second year dental hygiene students give their research presentations to audiences in nearby rooms. It’s the 49th annual Table Clinics night, January 25, 2019. 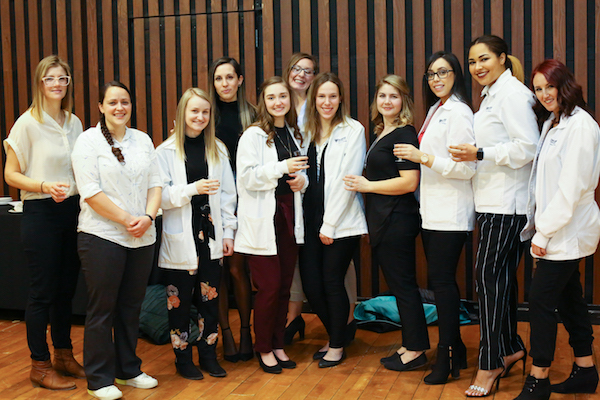 Dentistry students prepared for this evening for over a year, researching their topics, creating a research poster, and preparing concise, easily understood presentations. To prepare for this event, the dental hygiene students worked in groups of four or five to select and research a topic. On the big night they give 15 to 20-minute presentations that focus on the best practice standards of care. The range of topics covered is impressive in its breadth, showcasing what varied professions dentistry and dental hygiene are. 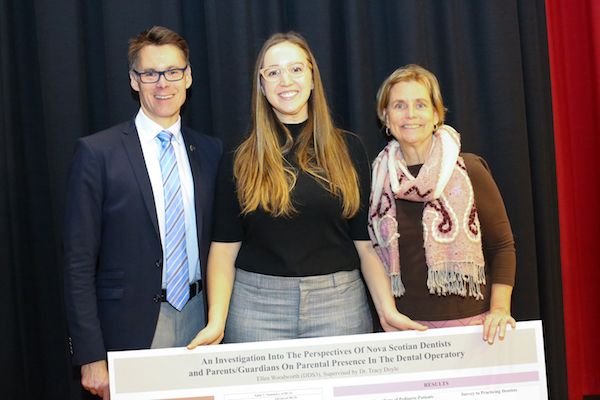 The dental hygiene presentations included oral cancer screening, HPV in the oral cavity, cannabis, and an examination of what is in drinking water. The dentistry students were equally ambitious. There were posters on ergonomics, occupational hazards, anxiety management, and the applications of 3D printing in dentistry. One student explores the use of Botox to treat gummy smiles while another analyses the microbiomes associated with periodontitis and peri-implantitis. Other topics include the effects of vitamin D deficiency on the oral cavity, the opioid crisis, oral health outcomes in preterm infants, the effectiveness of charcoal toothpaste, and stress among dental students. 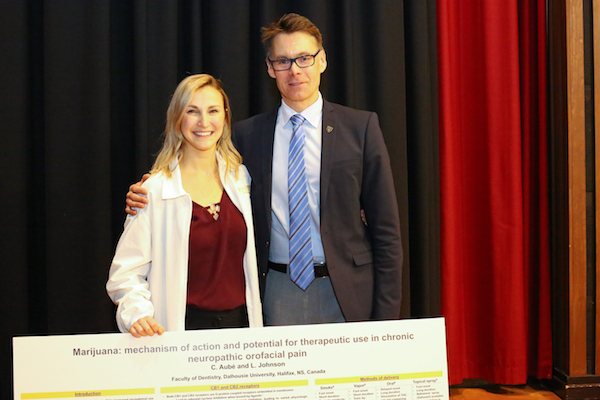 Stress and excitement were definitely part of the evening as the judges circulated with their clipboards, but most students admitted that giving their presentations became easier each time they did it. It was also an evening of fun and reunions. Groups of alumni from many different grad years came to Table Clinics to get their CE points, see what this year’s students are working on, reconnect with faculty members, and meet up with their classmates for impromptu reunions at the end of the evening. Nearly 500 people attended the event. Of course, the evening was also about the prizes. As always, a big thank you goes out to all the judges, advisors, sponsors, and those who came out to support the students. First place: What’s in your water? Second place: Cannabis: Newly legalized!